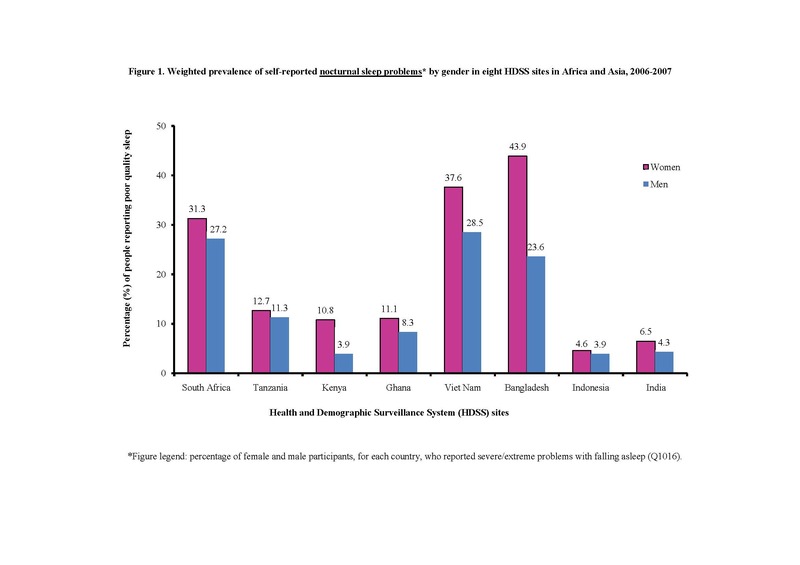 U. WARWICK (UK) — The first pan-African and Asian analysis of sleep problems reveals that an estimated 150 million adults in the developing world suffer from sleep-related problems. Levels of sleep problems in the developing world are approaching those seen in developed nations, linked to an increase in problems like depression and anxiety. The study, led by researchers at the University of Warwick, is published in the journal Sleep. The researchers found a rate of 16.6 percent of the population reporting insomnia and other severe sleep disturbances in the countries surveyed—close to the 20 percent found in the general adult population in the West, according to nationwide surveys in Canada and the US. The researchers, including investigators from the INDEPTH Network in Ghana and the University of the Witwatersrand in South Africa, looked at the sleep quality of 24,434 women and 19,501 men aged 50 years and over in eight locations in rural populations in Ghana, Tanzania, South Africa, India, Bangladesh, Vietnam, and Indonesia, and an urban area in Kenya. The strongest link was found between psychiatric conditions like depression and anxiety and sleep problems, mirroring trends seen in the developed world. There was striking variation across the countries surveyed—Bangladesh, South Africa, and Vietnam had extremely high levels of sleep problems, in some cases surpassing Western sleeplessness rates. However, India and Indonesia reported relatively low levels of severe sleep problems. The research also found a higher prevalence of sleep problems in women and older age groups, consistent with patterns found in higher income countries. Saverio Stranges, the leading author of the paper, and colleague Ngianga-Bakwin Kandala performed the analyses. Stranges says: “Our research shows the levels of sleep problems in the developing world are far higher than previously thought. “This is particularly concerning as many low-income countries are facing a double burden of disease with pressure on scarce financial resources coming from infectious diseases like HIV, but also from a growing rate of chronic diseases like cardiovascular diseases and cancer. “This new study suggests sleep disturbances might also represent a significant and unrecognized public health issue among older people, especially women, in low-income settings. Bangladesh had the highest prevalence of sleep problems among the countries analyzed—with a 43.9 percent rate for women—more than twice the rate of developed countries and far higher than the 23.6 percent seen in men. 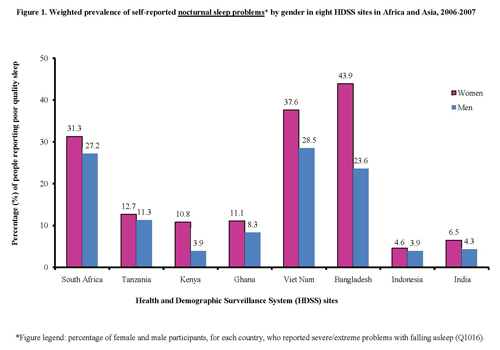 Bangladesh also saw very high patterns of anxiety and depression. Vietnam also had very high rates of sleep problems—37.6 percent for women and 28.5 percent for men. Meanwhile in African countries, Tanzania, Kenya, and Ghana saw rates of between 8.3 percent and 12.7 percent. However, South Africa had double the rate of the other African countries—31.3 percent for women and 27.2 percent for men. India and Indonesia both had very low prevalence of sleep issues—6.5 percent for Indian women and 4.3 percent for Indian men. Indonesian men reported rates of sleep problems of 3.9 percent and women had rates of 4.6 percent. The study was supported by the World Health Organization and funded by the National Institute on Aging of the National Institutes of Health and by the Wellcome Trust. The authors gratefully acknowledge the INDEPTH Network in Accra, Ghana, and the Health Statistics and Informatics from the World Health Organization in Geneva, Switzerland, for publicly providing the INDEPTH WHO-SAGE multicenter study data.